Today’s post is all about the affordable Fragrance gift ideas from Marks & Spencers. In this post I have rounded up seven of amazing fragrances that you can gift to women of your life. Be it your best friend, Mom, wife or even a colleague. These fragrances are perfect for gifting to your Secret Santa this Christmas season. These are the perfect gifts or stocking stuffers for this Christmas. The moment I saw the packaging, I fell in love. They have all variety of fragrances. Be it woody, spicy, sweet or floral – Everything’s covered. I decided to pick few fragrances along with 2 hand creams. In this post, I will only be featuring the women’s fragrances. What really attracted me most about them is the excellence in packaging. They are no lesser than any high end perfume. Also, they have fragrance gift sets that contains Shower gel, Body Lotion and fragrance from the same scent family. This is a great gifting option too. I also loved how they have two different size options for each variant. Elegant & beautiful, right ? 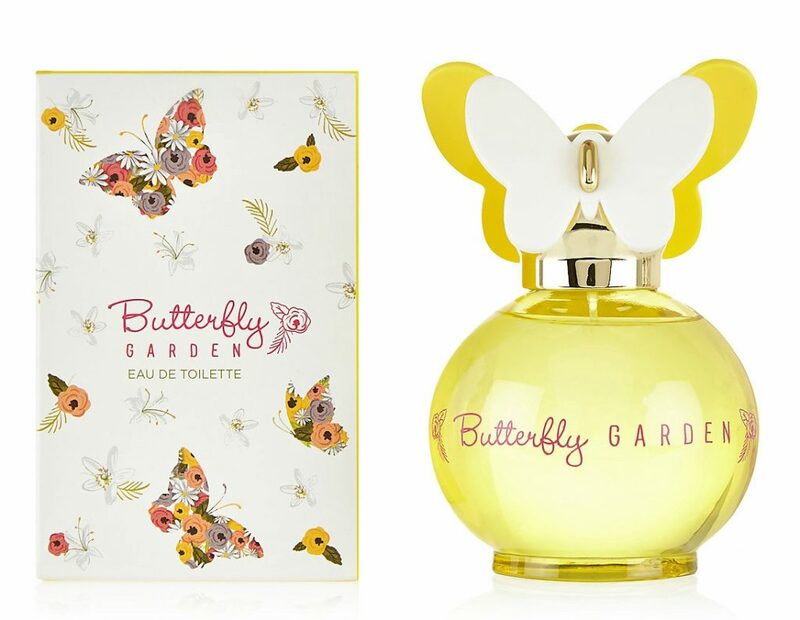 Butterfly Garden is a pretty, floral fragrance opening with sparkling top notes of mandarin, orange and pear. 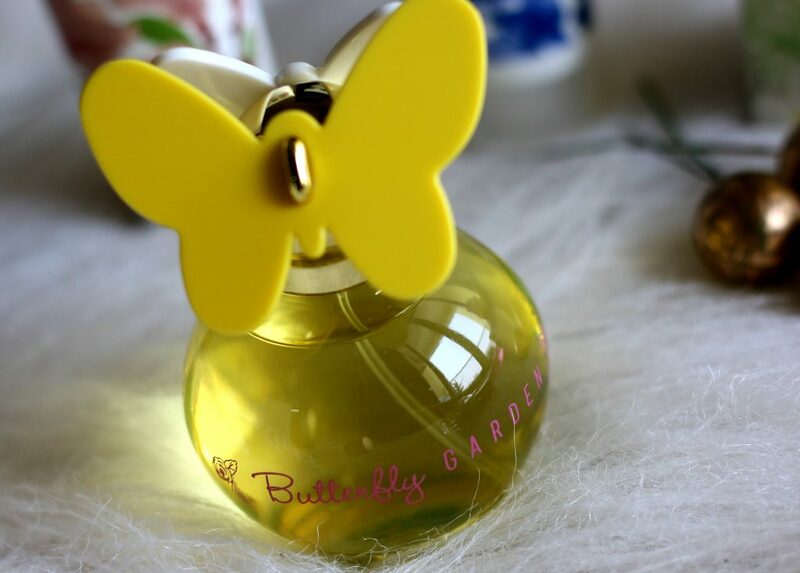 Comes in this super adorable bottle that reminds me of Marc Jacobs. It’s a very beautifully packaged fragrance. Perfect for summer months. The fragrance is very subtle and pleasant. Not as long lasting as the high end ones. But, upto 5-6 hours, It’s good. Great for everyday wear. This is a great pick for Christmas. Alcohol denat: aqua, parfum, butyl methoxydibenzoylmethane, benzophenone-1, bht, amyl cinnamal, butylphenyl methylpropional, cinnamal, citral, citronellol, limonene, hydroxyisohexyl 3-cyclohexene carboxaldehyde, linalool, ci 17200, ci 19140. With its beautiful packaging, this can be a great purse spray. 2 sizes available – 100 ml and 25 ml. In the pictures, you can see 25 ml version. These are great stocking fillers. 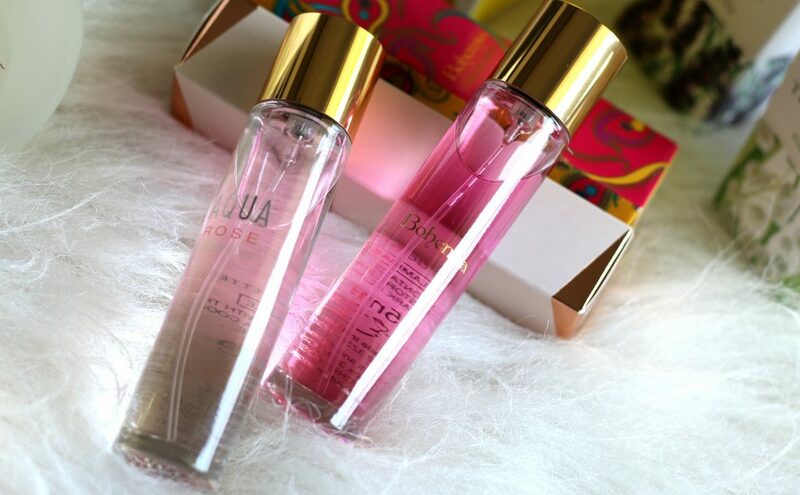 Though the title says ‘Rose’ ; Don’t expect this fragrance to have any ‘rose’ notes. In the ingredients also I don’t see rose anywhere too. The fragrance is not very over powering. It has a decent wear time. For the price- I think it’s a great gift option. This has a very warm pleasant fragrance. If you are into sweet, summer-y scents. Fragrance goes floral and slightly fruity too. Not too strong. Lasts for a long time. This is a must try from the brand. 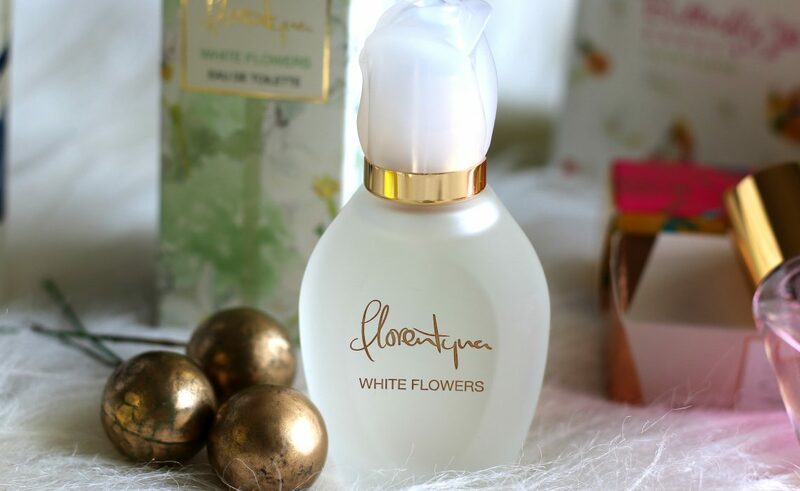 Sophisticated and feminine, this delicately scented range of floral fragrances and bath and body treats from Florentyna is perfect for any beauty lover. It’s a really unique and beautiful feminine fragrance. In one glance – I loved it. The packaging is so elegant and festive. It has a sweet fragrance that is perfect. 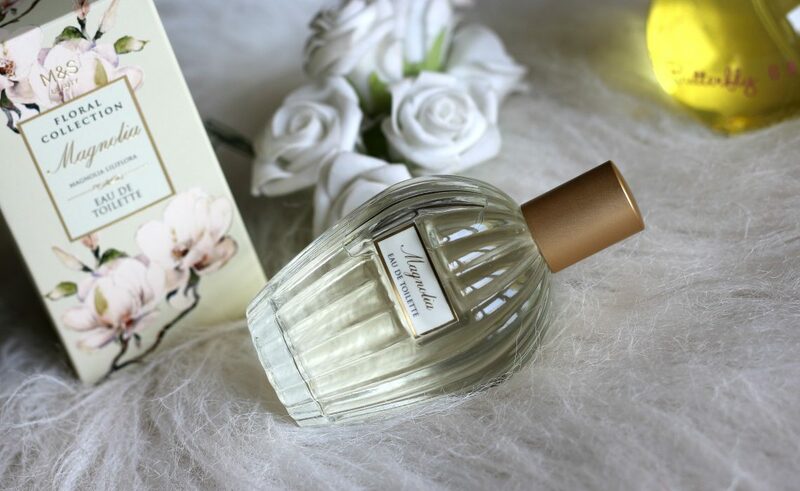 Centred around a floral heart of white lilies, enhanced with delicate notes of neroli and jasmine blossoms. This is my favorite from the brand. With a traditional relaxing fragrance of lavender, this sophisticated Eau de Toilette evokes a timeless femininity. Perfect gift for all lavender fragrance lovers. 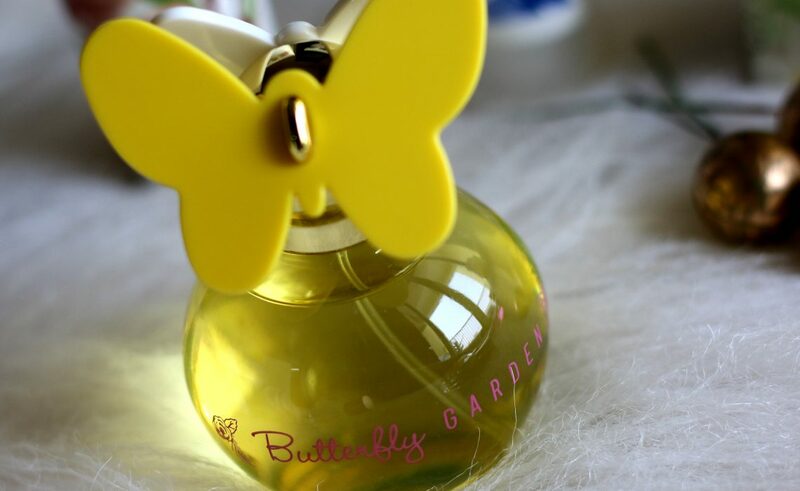 With its beautiful packaging and great fragrance that lasts upto 5 hours. This is perfect for gifting this season. Alcohol denat, aqua, parfum, linalool, benzophenone-2, alpha-isomethyl ionone, hydroxyisohexyl 3-cyclohexene carboxaldehyde, limonene, geraniol, cinnamal, lavandula angustifolia (lavender) extract diazolidinyl urea, iodopropynyl butylcarbamate, ci 17200, ci 42090..
My best tip to make the fragrance last longer is layer with the products from the same range.It’s a very refreshing and uplifting scent. Best tip – use the talc from the same range after every bath to prolong the fresh fragrance as long as possible. Fragrance is not overpowering at all. I use it a lot when I am at home. Fragrance is relaxing as well. Capturing the delicate fragrance lily of the valley, this sophisticated of eau de toilette evokes a timeless femininity. If you are all about mild fragrance – This is perfect. The sweet floral scent of lily of the valley captured in this cute bottle. Alcohol denat. • aqua • parfum • hydroxycitronellal • citronellol • butylphenyl methylpropional • linalool • hexyl cinnamal • hydroxyisohexyl 3-cyclohexene carboxaldehyde • benzophenone-2 • limonene • benzyl benzoate • geraniol • propylene glycol • citral • benzyl salicylate • convallaria majalis (lily of the valley) extract • ci 19140 • ci 42090. Capturing the fragrance of sweet magnolia flowers, this sophisticated eau de toilette evokes a timeless femininity. Alcohol denat, aqua, parfum, magnolia sieboldii (magnolia) extract, hexyl cinnamal, benzyl salicylate, alpha-isomethyl ionone, hydroxyisohexyl 3-cyclohexene carboxaldehyde, limonene, linalool, hydroxycitronellal, coumarin, isoeugenol, butylene glycol, eugenol, benzyl benzoate, geraniol. This is a long lasting fragrance compared to other M&S fragrances. When I say long lasting – Don’t expect it to last as much as your Dior or Marc Jacobs ones. Well, lets’s look at it at a price point of view and its beautiful and elegant presentation part. 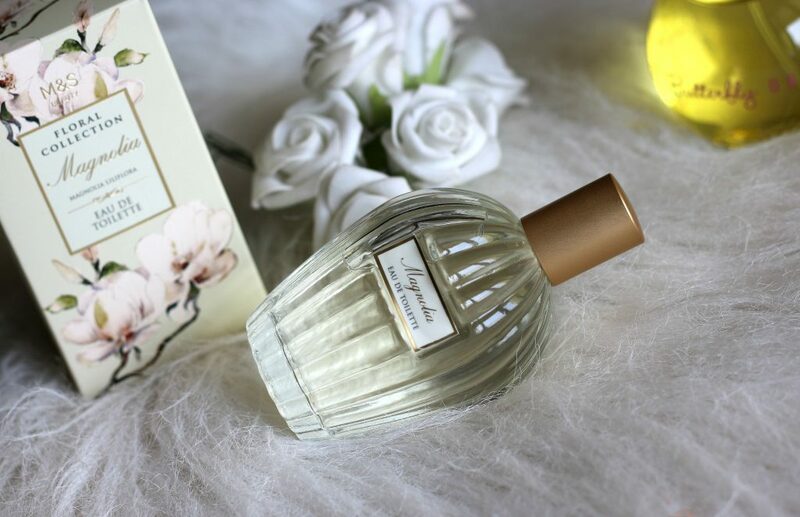 Marks & Spencer Women Floral Collection Magnolia is a very refreshing, light and feminine fragrance. Floral notes to it. Starts with a very strong Magnolia flower scent. I would say, the satying power is about 3-4 hours or so. Really beautiful bottle makes it a lovely gift to your best friend or loved one. 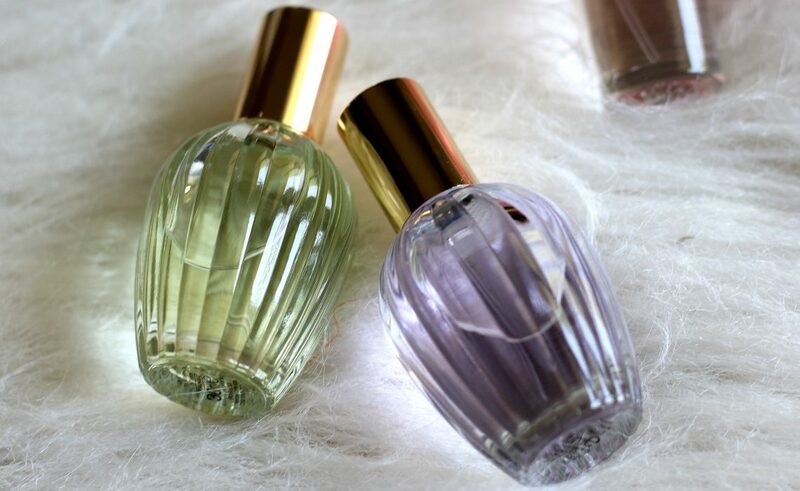 Overall, these are my top picks from M&S fragrances section and I think these are the most affordable fragrances available ever with a beautiful presentation. I think these are great stocking fillers. The longevity can be increased by layering the products from the same range. Especially, using body lotion or talc from the same fragrance family. Well, I really do hope that the lovely people at Marks and Spencer can do something about the longevity part. If that is taken care. Well, these will definitely be flying off shelves. No doubt about it. Availability – M&S Products can be purchased online from the website here and also from their stores nationwide. 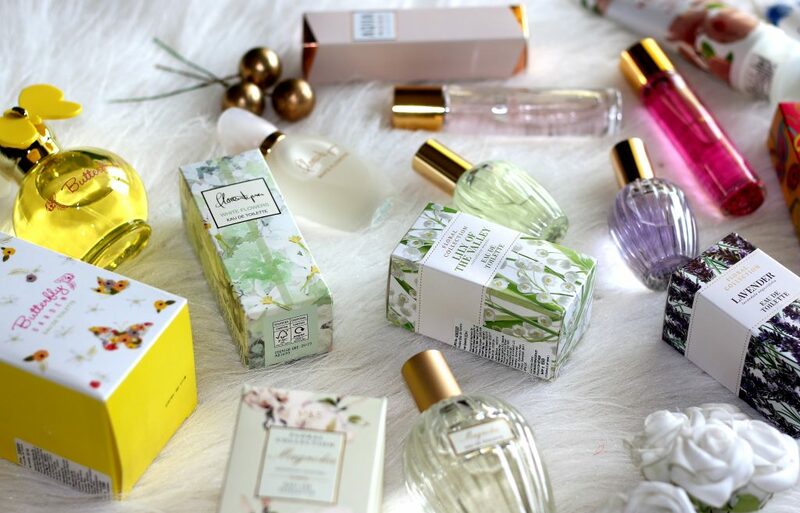 Have you tried any of these fragrances from M&S ? If yes, What do you think of them ? Do you think these can be the perfect stocking fillers ? These fragrances look and sound absolutely amazing, I wish I could smell these from your post. You have shared some of my favs! Love the products you have shared here. Ankita | Beautistaa.com | Confidence, Fashion, Beauty & Lifestyle! Fragrances from Commodity for your Valentine!